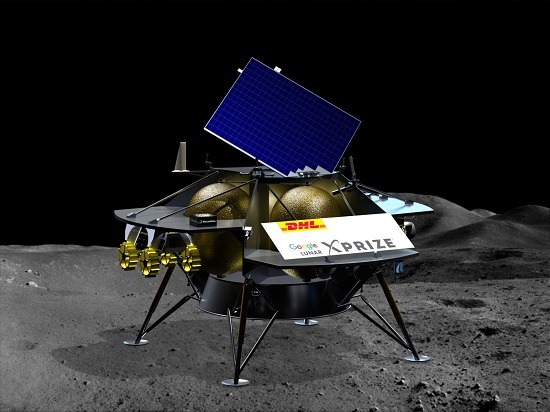 Astrobotic has pulled out of the Google Lunar X Prize, according to an update on the Space Angels Network website. This focus on the business model and securing customers, combined with their impressive technical progress, was one of the key factors that convinced Space Angels to invest in their venture. Astrobotic has also successfully secured a number of key partners including NASA, Airbus Defence and Space, DHL, and Aerojet Rocketdyne to bolster their effort to become the world’s first lunar payload delivery service. In short, Astrobotic is making all the right moves to position itself in order to succeed in, and drive the growth of, the emerging lunar economy. The Space Angels Network said Astrobotic announced the decision to withdraw from the $30 million competition on Monday. There are no notices about a withdrawal on the company’s website or Twitter feed as yet. The announcement came less than two weeks before a Dec. 31 deadline for teams to have verified launch contracts to continue in the competition. In order to win the prize, teams must launch their spacecraft by the end of 2017. Astrobotic has agreements with two Google Lunar X Prize competitors — Team HAKUTO of Japan and Team AngelicvM of Chile — to carry their rovers to the surface. A third competitor, Puli Space of Hungary, has reserved space for a time capsule and has the option of adding its own rover to Astrobotic’s lander. Unless these teams make alternative arrangements with competitors with verified launch contracts, Astrobotic’s 2019 launch date will put them out of competition. To date, four teams have verified launch contracts for 2017: Moon Express of the United States, SpaceIL of Israel, Team Indus of India, and the international Synergy Moon team. The Google Lunar X Prize is offering a $20 million first prize for the first privately built vehicle to travel at least 500 meters across the lunar surface and return high-definition video. There is a $5 million second prize. How can this be true? Back in 2011 you reported, right here, that Astrobotic had actually signed a contract with SpaceX for a Falcon 9, and that they were the first GLXP team to do so. Go look into MoonEx and Synergy Moon. Neither of their launch plans are even remotely credible yet you continue to “report” right here that they have launch contracts. If I sign a contract with the 10-year-old down the street to put my spacecraft on an Estes “d” engine does that count? So Astrobotic is formally announcing that it will miss the 2017 launch date by at least 2 years. It is therefore formally relieving itself from the bureaucracy. If they miss the December launch, no prize money. All that hardware now will just sit in a store room gathering dust. You would think amateur engineers would know how to do some arithmetic and see if they have any funds forthcoming or available to pay for a launch. X-Prize people make decisions about what counts and what doesn’t as a launch contract, not people that report the news. That Astrobotic claimed contract was never confirmed by SpaceX, nor verified by any other party. The agreement with SpaceX seems to have fallen through. The X Prize staff verify that teams have contracts with launch providers. They don’t seem to pass judgment on the likelihood of an actual launch succeeding. With the current rules they wouldn’t get any anyway, as they wouldn’t land before the end of 2017. On a side note this guy doesn’t seem to respect any of the teams in the competition and brags about how good his company is. Astrobotic shouldn’t have been allowed in the competition due to his attitude. I was listening to one of the interviews given by a member of Team Indus. He said that there is a good chance the deadline will be extended by a month. So as long as they launch by December 31st 2017 they will remain in the competition. I suspect that it is not so much paying for a launch, although that is very expensive, but developing a genuinely Moon rated lander that actually works. SpaceX is also falling behind on contracts due to the last 2 Falcon 9 accidents and they’ll have a lot of work to do to make up for the lost time. A GXP lunar team might have problems securing a launch before the end of 2017. Would the organizers take into account that a delay was due to the launch provider and not the team and the team’s hardware? Price will be a huge issue and SX is the cheapest rocket on the shelf. Yes, they have a chance now of developing a real business model instead of just doing a stunt. Not in this case. Astrobotic made that claim in 2011, not the X-prize people and it was repeated over and over by the press folks like it was real. The press just repeated the press releases, like Doug is doing here, without any critical thinking required. Astrobotic never had any such contract. The X-prize folks never verified anything either, since there wasn’t anything to verify. It was all an obvious lie, Astrobotic never had anywhere near enough money to make a down-payment on a Falcon 9. They still don’t. It didn’t “fall through”. It never existed. They may have paid SpaceX 10k or so to do some analysis for them, but there was never a launch contract. Astrobotic has never had that kind of money, they still don’t.